According to a news release from the U.S. Postal Service, once again, USPS is offering North Pole postmarks on holiday mail in 2014. Requests must be received in Anchorage by December 15, 2014 in order to ensure delivery by Christmas. The Postal Service receives hundreds of thousands of requests each year for North Pole postmarks from around the world. The service is provided at no cost. Each card or letter must have the correct amount of postage and be addressed. 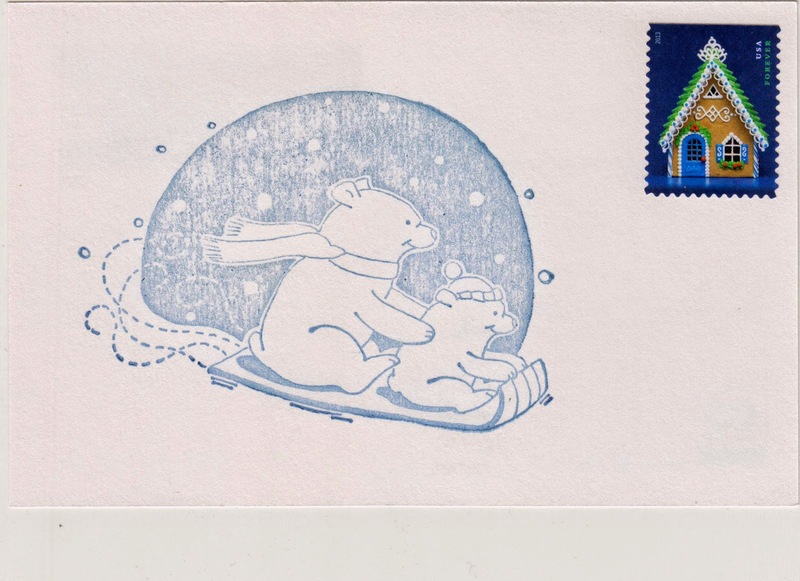 Postcard US-2529937 to Taiwan shows a rubber stamp impression of polar bears sledding on a sleigh with a USPS Gingerbread House Forever stamp, before the card was sent in for cancellation last year.